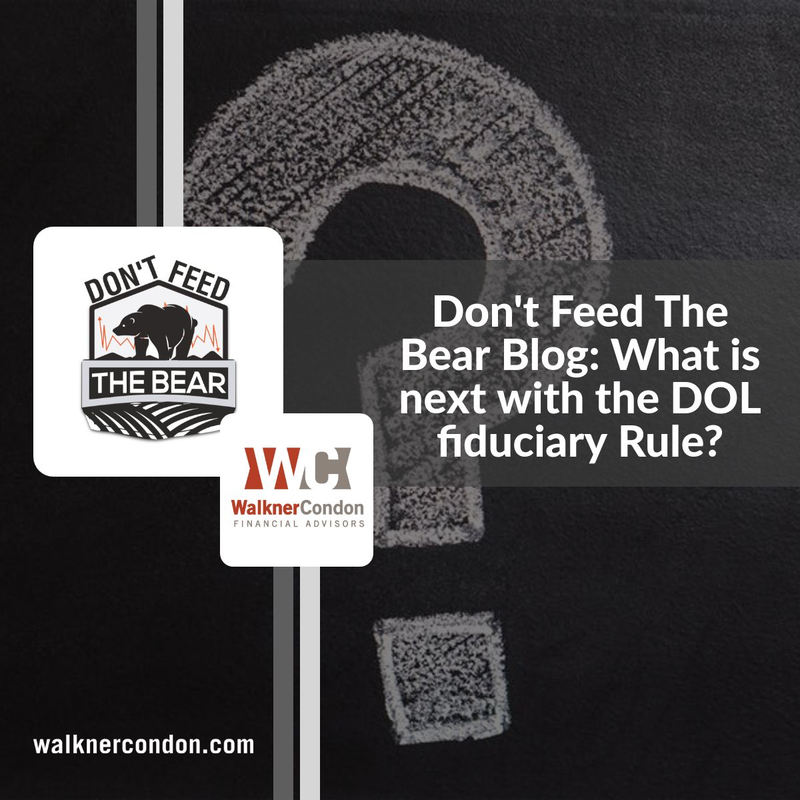 What is Next with the DOL Fiduciary Rule? On March 15, 2018 The U.S. Court of Appeals for the Fifth Circuit moved to strike down the Department of Labor’s (DOL) fiduciary rule. This has come after the Trump Administration delayed the full implementation until July 1, 2019 to study the ramifications of the rule. The Trump Administration has been seeking to roll back regulation in many areas and this is no exception. The DOL rule, which was rolled out by the Obama Administration, focused heavily in retirement accounts covered by ERISA. Due to the inability to get legislation passed that would have been more comprehensive, this rule included 401k and IRA accounts (among others) but did not cover taxable accounts. The goal of the rule was to increase disclosure to investors and also force “advisors” to put the best interest of their clients ahead of their own. As a result of the rule being struck down as well as the delay it is less likely that we will ever see the rule implemented. Why is this bad for investors? Simply put, it is very troubling to see financial companies and advisors fight so hard to avoid having to put client interests before their own. In additional to insurance representatives offering products with loads of conflicts of interest, many “fee-only” financial advisors aren’t even fee-only! If no regulation comes to fill the void we will continue to muddle around with the present system of investors not clearly being able to tell what their financial representative stands to gain in the transaction. Why is the good for investors? The DOL rule was inherently flawed due to only being able to cover transactions related to ERISA (meaning retirement accounts). With varying standards on different accounts, this was set up to be a confusing playing field. Additionally the carve out to exempt advisors from the rule under the Best Interest Contract Exemption (BICE) was confusing and would likely just be another form that breezes past the investor. In our opinion, we need to finally delineate the standards of care between the financial representatives providing the advice. Almost anyone can be called a “financial advisor”, whether they are receiving fees, commissions, or a combination of both. There are even many cases where “financial planner” is used as a title but the financial representative is not a Certified Financial Planner (CFP®). This unnecessarily obfuscates financial designations. Certified Financial Planners (CFP®) may can call themselves Financial Planner. Fee-only advisors may call themselves Fiduciary Financial Advisor. All others categories of “advisor” that include any financial representative that is eligible to receive a commission may call themselves Registered Representative. It is our view that there does not have to be overreaching legislation to enact meaningful reform in our industry. With new titles, fiduciaries would be clearly delineated from other financial representatives. Investors would have the choice of who they will want to work with and the industry would hopefully be nudged in the right direction of providing advice that is in the best interests of their clients. The SEC has been working on a fiduciary rule of its own. John Clayton, Chairman of the SEC, indicated that we should see it sometime in 2018. We at Walkner Condon Financial Advisors welcome a rule that would bring some clarity to the opaque nature of our business. We do know that the rule will certainly face tests from the Trump administration as well as the insurance and brokerage industries, but hopefully we will have something in place in the next few years. As the SEC is better positioned to release a rule that will cover more financial transactions, our bet at this point is that we are more likely to see a rule implemented from them rather than the Department of Labor. If you have any questions on this, please don’t hesitate to reach out. If you found this look into our industry helpful, feel free to share it with your friends.